Officially known as the Amatsu Shrine Spring Grand Festival, this festival can be seen every April 10 & 11 at Amatsu Shrine, a short walk from Itoigawa Station. Centuries old, the festival is held to pray for a bountiful harvest and good catch of fish in the year ahead. 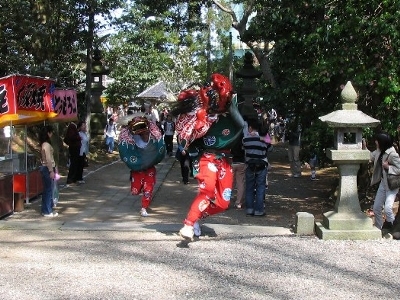 The festival’s popular name, the Itoigawa Fighting Festival, comes from the stirring omikoshi fight held in the morning of April 10 between two teams representing the local districts of Teramachi and Oshiage. 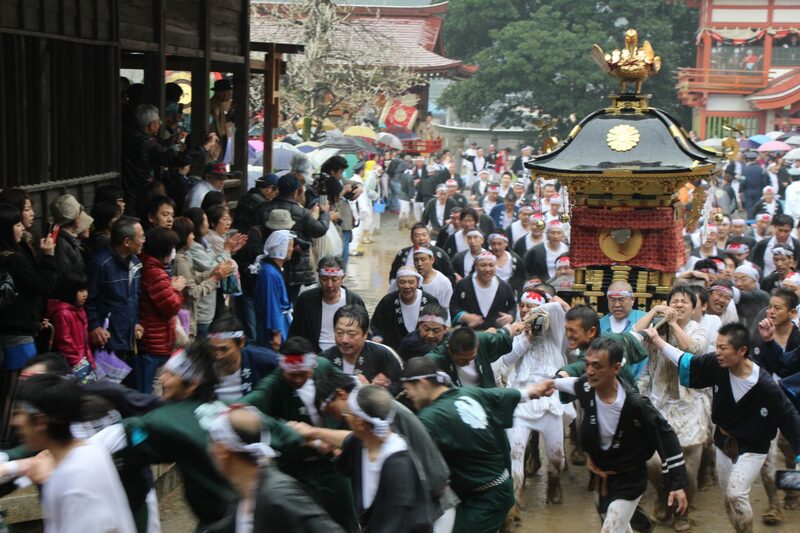 Carrying 600 kilogram omikoshi shrines, the teams chase each other around the shrine grounds, clashing their shrines together in a dramatic display of strength. The shrines are often damaged in the fray as nearby spectators run for cover. After roughly an hour of fighting, the shrines are brought before the priest who is said to consult with the local gods to determine the winning team. It is said that the two shrines represent male and female gods, and so the fighting of the shrines is not really fighting, but a display of fertility which blesses the participants with large, prosperous families. It is also said that the winning district predicts the season ahead: if Oshiage wins, it will be a good catch of fish, if Teramachi wins it will be a bountiful harvest. As the dust settles and the crowds calm, the attention moves to the large stage in the middle of the shrine grounds. 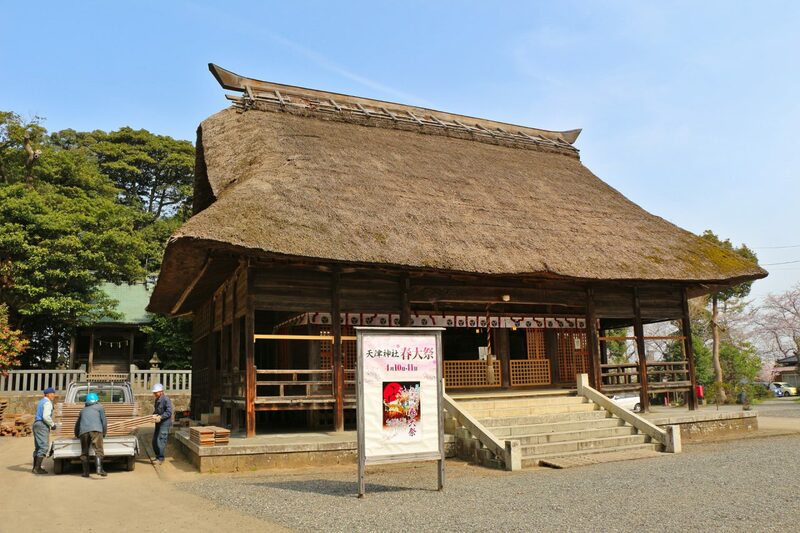 On this stage, local children and adults perform 10 ancient bugaku dances. Bugaku are special, elegant dances which were traditionally held at events hosted by the Imperial Court or at important temples and shrines. 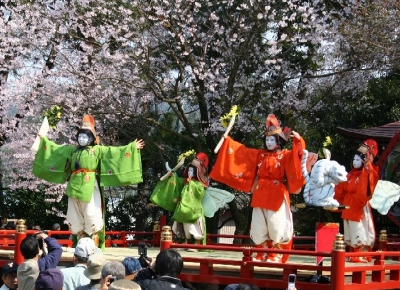 The unique bugaku dances performed during the Amatsu Shrine Spring Grand Festival have been handed down over the centuries by local families and today are recognized as a Nationally Important Cultural Folk Property. Don’t miss an opportunity to experience the powerful elegance of this ancient tradition.